I have had, since 2004, one of the best gigs any bird nerd could ask for. That was when I was awarded my first Forest Service (FS) bird survey contract for three districts in the Pisgah National Forest. To say I didn’t know what I was getting into would be a great understatement. I was given some over the counter maps and a list of coordinates and was told all I had to do was find the points, mark them and then survey them. Some of the obstacles, hmmmm, many of the points weren’t on any of the maps – heck some of the roads the points were on weren’t on the maps. And finding the points – well finding a piece of rebar stuck in the forest floor, years ago, with descriptions and bearings to witness trees proved to be quite challenging. I was basically a GPS “newbie” having just taken an introductory GPS/GIS course at Haywood Community College (HCC.) And I must admit the course didn’t instill a lot of confidence. I remember spending hours with my instructor, in the woods, waiting for those survey-grade GPS units on tripods to connect to enough satellites to get a reading. However, my old trusty handheld Garmin etrex hardly ever loses a signal and thanks to HCC instructors who took the time to show me how to use the basic functions, especially the “go to” I was able to muddle through. Believe it or not I even found several of those pieces of rebar. Not all, of course, but enough to give me confidence in my GPS and know when it said I was at my destination that I was really close to the original point. And, thankfully, I’ve had some wonderful FS CORs (contracting officers) to work with. The kind of people who understand all the logistics and conundrums associated with finding and/or establishing points then re-visiting them across a million acres of national forests. So here it is spring 2018 and after 14 years of this it’s still an adventure that gets my heart pumping in the predawn darkness as I gather binoculars, GPS, notebook etc and head out for an avian rendezvous. Depending on the morning I could be near Hiwassee Dam, or Jack Rabbit Campground, or Black Balsam, or the Pink Beds, or Mount Mitchell, or Roan Mountain or beneath Table Rock, etc., ect. And surely birds are the main attraction. A morning chorus from deep in the national forest can be quite stirring with hooded warblers, ovenbirds, wood thrushes, red-eyed vireos, scarlet tanagers, rose-breasted grosbeaks, northern parulas and more all raising their voices to greet the new day. But the forest is not one-dimensional. I remember standing on a point and watching mama bear, with her nose in the air, trying to ascertain my location before grunting at her babies and strolling off in the opposite direction. On Roan Mountain I encountered four whitetail bucks, antlers thickly covered in velvet – they approached within 50 feet before leaving the trail for the woods. In Cheoah District I saw one of the most beautiful creatures I’ve ever seen – a large, freshly shed yellow phase timber rattler, so bright it was almost iridescent. I have had the great fortune of encountering not one, but two broods of 17-year cicadas; brood XIV in 2008 and brood VI just last year. The sound these insects can make in unison, by the thousands, can be nearly deafening. And even wrong turns in the forest can prove rewarding. 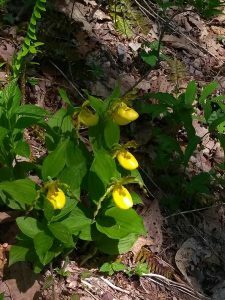 I thought I was headed back to the gate in Harmon Den a week or so ago when I encountered a huge colony of yellow lady slipper on the roadside. I was scratching my head trying to figure how I could have missed such an impressive stand of orchids for more than a decade when I came to a large tree across the road – there was no tree across the road when I entered the forest – so I backtracked and discovered I must have been daydreaming and took a “wrong” turn. I have till June 15 to finish this season, wrong turns, bears, birds, snakes and all – then, if I’m lucky, I’ll awaken in the predawn darkness on May 1, 2019, gather binoculars, GPS, notebook etc and get to do it all again.